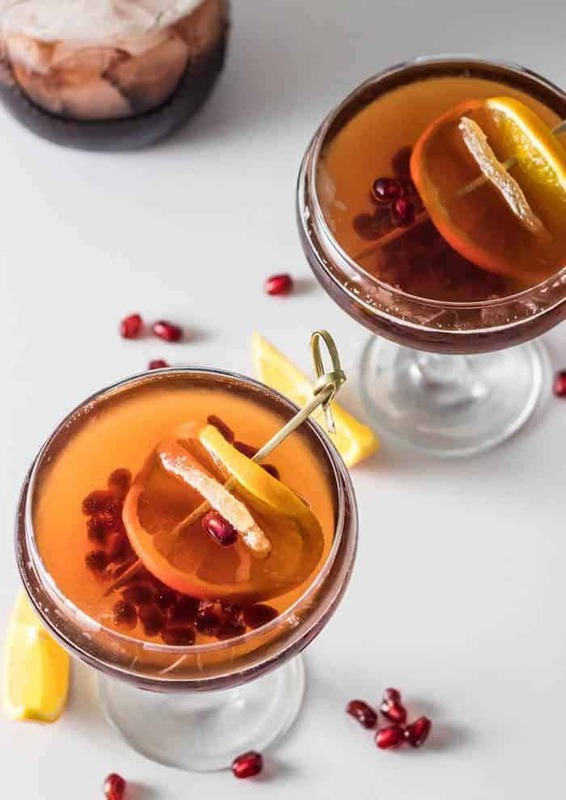 A festive time of year calls for a festive cocktail, right? 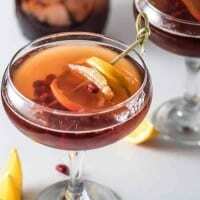 Donner and Blitzen: A Ginger Brandy Cocktail makes a lovely addition to your holiday cocktail party… Combine ginger simple syrup, brandy, pomegranate molasses, and pomegranate juice with ice in your cocktail shaker, pour into your favorite glassware, top off with ginger beer, and a few shakes of orange bitters. Garnish with an orange slice, and crystallized ginger. Bellissimo! Why Donner and Blitzen? Well, my husband Mark and I created this cocktail together. He and I share German ancestry. He is Danish and German; I am English, German, and Native American. So, we wanted a name that spoke to our common German heritage and the holidays… Donner=thunder and Blitzen=lightning. Really. Of course we all know they’re famous members of Santa’s reindeer team, right? I stumbled upon ginger simple syrup recently quite serendipitously. My most recent dessert creation is a Lemongrass and Ginger Tapioca (due out soon). The ginger syrup was a delicious byproduct of making crystallized ginger to garnish the pudding. 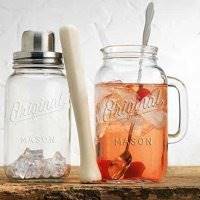 As soon as I licked the spoon, I knew it had to be a key ingredient in a cocktail. I relied on savory flavor profiles to help jump start the process of finding the right combination of ingredients. I do a fair amount of Indian and Middle Eastern cooking, and both cuisines combine pomegranate and orange with ginger. The more difficult variable, though, was the booze. We started out with the ginger syrup, bourbon, pomegranate juice, ginger beer, and a bit of orange blossom water. The orange blossom water was overpowering even when exercising restraint. After switching out the orange blossom water in favor of orange bitters, the bourbon was still lost. 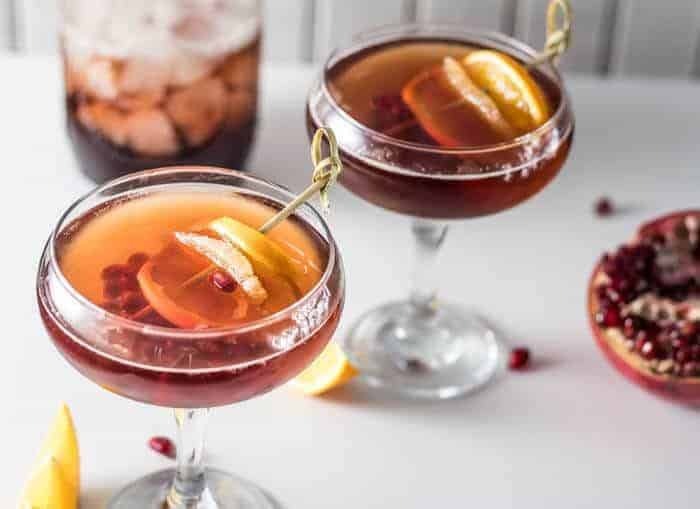 I opted to swap the bourbon for brandy, and the cocktail hit the “sweet spot” – not too sweet, smooth, complex, and all the flavor components were present and balanced. Success! We plan to enjoy Donner and Blitzen with New Mexican Red Chile Posole and tamales Christmas Eve. Christmas Day the menu stars a standing rib roast. I’d love to hear about your holiday menus… Leave a comment below? 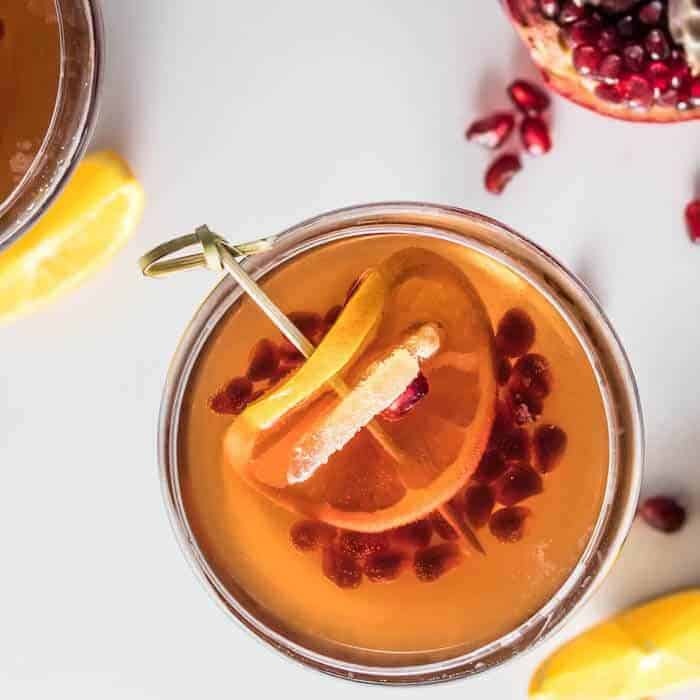 A festive time of year calls for a festive cocktail, right? 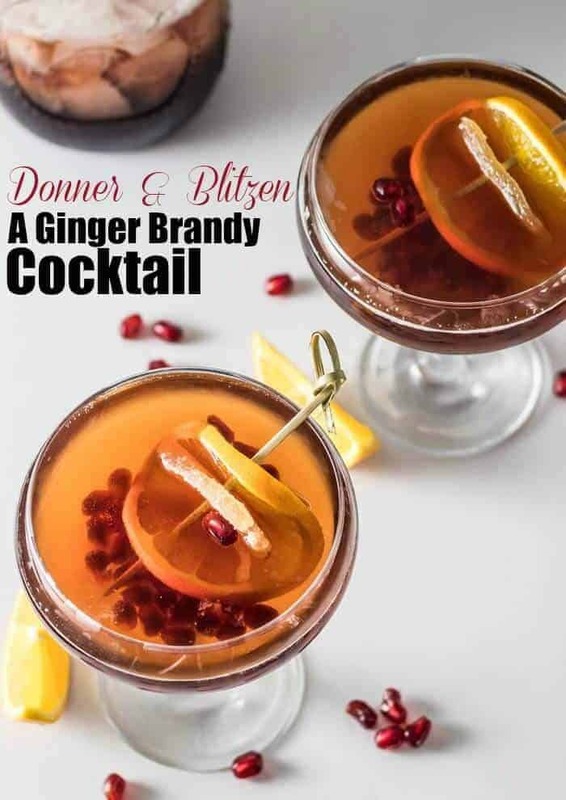 Donner and Blitzen: A Ginger Brandy Cocktail makes a lovely addition to your holiday cocktail party... 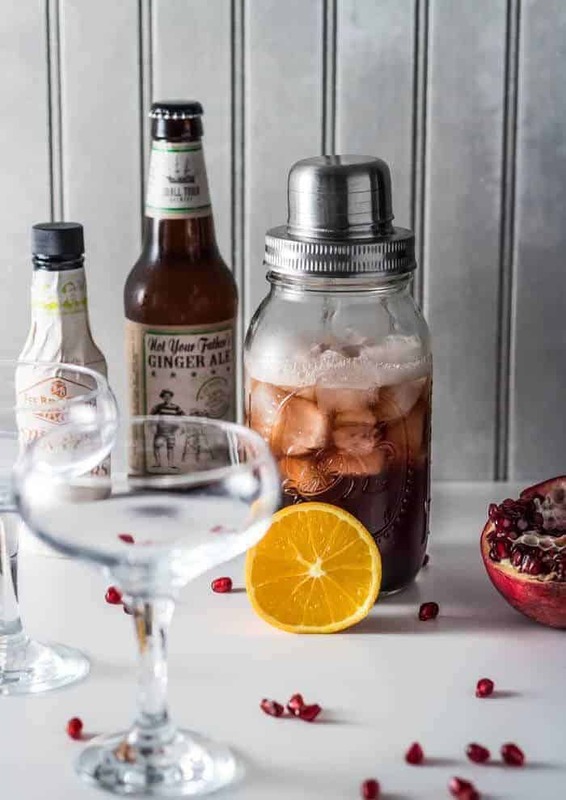 Combine ginger simple syrup, brandy, pomegranate molasses, and pomegranate juice with ice in your cocktail shaker, pour into your favorite glassware, top off with ginger beer, and a few shakes of orange bitters. Garnish with an orange slice, and crystallized ginger. Bellissimo! 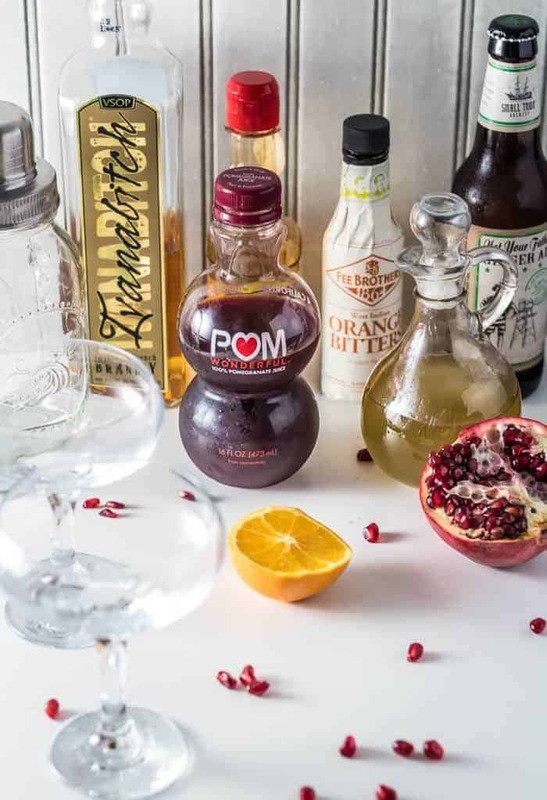 Add brandy, ginger syrup,pomegranate juice and molasses, and bitters to a cocktail shaker with ice. Shake vigorously. 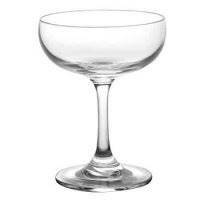 Pour into glasses (we like coupe glasses). Top off with chilled ginger beer. Garnish with thinly sliced orange and candied/crystallized ginger. 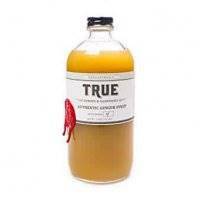 If you don't wish to make your ginger syrup, good commercial ginger syrup is pretty widely available, and I included a link above to one from Amazon.com. Ginger beer can be both alcoholic and non-alcoholic. We like an ale (alcoholic) ginger beer. Use your favorite. Calories are an approximation only (from MyFitnessPal.com) and based on 2 ounces Crabbie's Ginger Beer and 1/4 teaspoon Fee Orange Bitters. I did not include garnishes as they vary.